Make no mistake – packing is the toughest task you’ll face during the preparation stage of moving out of your current home and moving into another house or apartment. Unlike any other pre-move job you’re going to have to tackle, packing for a move will last during the entire preparation period – that is from Day 1 (when your household move is confirmed) all the way until Moving day (the day you’re supposed to move out). To help you have a smooth and problem-free packing experience, we’ve already shown you how to pack like a pro and we’ve warned you against the top common packing mistakes that can really slow down or even halt your packing momentum. As a bonus, you’ve also offered you a super detailed week-by-week packing timeline (packing checklist) that will enable you to use effectively every hour of every day during the home packing process. 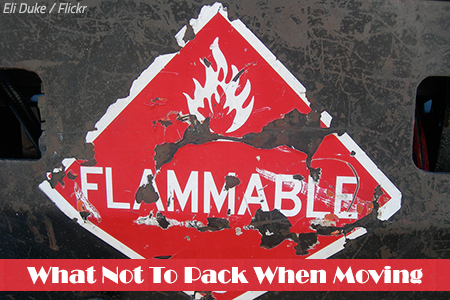 This time, we’ll show you what not to pack when moving home. Oh, yes, there are a number of items movers won’t move due to their hazardous, perishable or irreplaceable nature. And before we provide you with more information about what items not to pack for moving, let’s explain WHY there are things that long distance movers won’t move for you. The things movers won’t move include hazardous items, perishable food, plants, pets, and irreplaceable items. But why do movers refuse to transport them? There are several good reasons why professional movers won’t move certain items, and all of them are directly linked to safety. As you can probably guess, good moving companies rate safety very high and do everything in their power to keep people and property perfectly safe throughout the residential move. Dangerous items may cause damage to the rest of the items in the moving truck or even to the moving vehicle itself. Hazardous items may endanger the health and life of all participants in the house move, including the experienced relocation professionals. Hazardous goods could also hard the environment. Some perishable items, like food, for example, are likely to get bad while in transit and cause a big mess. Other perishables, such as plants and pets, won’t likely survive the relocation trip. Just think of the time you’ll lose to prepare and pack items that your movers won’t move in the end – time, energy, and resources lost forever. The best thing you can do under the circumstances is to contact the professional moving company you’ve chosen to use and request their specific list of non-allowables. Do that as soon as you’ve selected your mover and definitely before you’ve initiated the packing process. Remember that the federal law forbids moving companies from transporting such prohibited items, so the movers you select will be obliged to observe the established safety rules. No poisons of any kind will be allowed to be loaded into the moving truck. Do not waste your time packing hazardous goods because 1) moving companies cannot and will not transport them for you, and 2) you should not move them yourself for the same reason – they are really dangerous to be hauled hundreds or even thousands of miles across the country. There’s always a better solution than to risk your own health and the health of the people around you – read on the find out what that solution is. But first, let’s shed some light on what those moving companies restricted items are. Generally speaking, hazardous items are any items that are either flammable, or explosive, or corrosive. As you can see, there’s a real danger if any of those no-no items ignites or spills during the move. Some of the items in the non-allowables list won’t really surprise you (guns, ammunition, fuel or propane tanks, for example), while others may make you wonder about the severity of their hazard level (cleaning supplies, aerosol cans or bottles with liquor, for instance). Moving companies will agree to transport yard equipment as long as such power equipment pieces have been previously drained of fuel and packed safely for transportation. If you own firearms and ammunition, you must contact a licensed firearms dealer and arrange with them their shipment. Keep in mind that if you’re moving to a new state, that new state may have different gun laws than the start you’re about to leave. Make sure you research well the gun regulations in your destination before the move. It’s best if you manage to use up most of the above-mentioned hazardous items prior to Moving day so that you won’t have to worry what to do with them. If that’s impossible, then you can give whatever is left of them to your neighbors or good friends, or just. 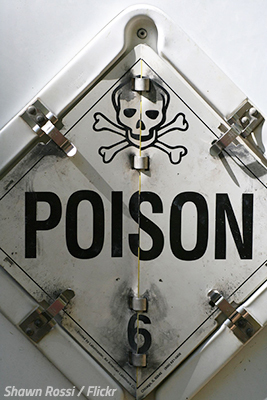 In the majority of cases, the only viable option is to just dispose of those dangerous goods (properly, of course) and purchase new ones upon arrival, especially if you’re moving to a new home that is far away. Do not pack perishable foods as they will not be accepted by your movers. However, if you’re only moving short distance, you may choose to transport some of those non-allowables with your own vehicle. After all, liquor (most often wine bottles) and various cleaning supplies are usually safe as long as you don’t expose them to extreme heat. In any case, contact your moving company for advice if you’re not sure whether it’s safe to take with you some of the hazardous goods listed above. get covered with mold if the loaded belongings spend a few days on the road. 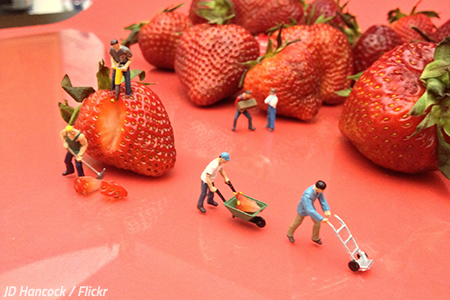 Most movers will not take perishables, but that doesn’t mean you need to throw away good food. If you’re about to move to another state, then make an effort to use up your food supplies prior to Moving day so that you won’t have to wonder what to do with in the last minute. Empty and clean your fridge a few days before the Big day. If you still have any food left before it’s time to move out, give it to neighbors, friends, or just donate it to people in need. On the other hand, some moving companies will agree to take canned foods that are relatively safe for long distance transportation. Make sure you let the movers know beforehand what types of non-perishable foods you have prepared for moving so there are no last minute misunderstandings. And if you happen to move moving only a short distance away, then there is no reason why you can’t transport some of the easily spoilt food supplies by yourself, in your own vehicle. Related: Free moving boxes? Wait, where’s the catch? Another one of the non-allowable items that moving companies do not transport, and the one you should not pack for moving, is plants. 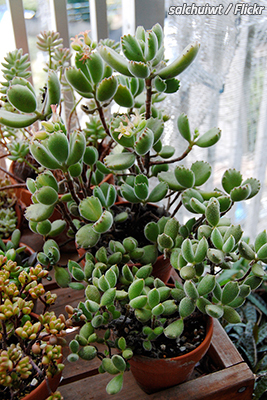 Plants will not usually survive a long distance move due to the highly unfavorable conditions in the back of the moving van – the temperature in the enclosed space can reach extreme values rather quickly. Sometimes you will find it really difficult to decide what to do with your cherished plants. The law forbids professional moving companies to transport plants on household moves longer than 150 miles. Add the risk of plant parasites being transported to another part of the country, and you’ll easily understand why your chosen moving company, regardless of how reputable and experienced it is, will refuse to transport any house plants for you. When moving cross country, what you should do is gift your precious plants to somebody who will continue to take good care of them. Maybe you know a friend or two who will be really glad to keep them safe for you? Some neighbors of yours may also be delighted to have some of your plants as well. Do the right thing instead of risking the well-being of your potted flowers. If you can’t think of anyone who will be interested, then try local schools, nursing homes or hospitals. For really short relocation trips, you can always choose to transport some of your plants in your own car. The best tip for moving plants to a new home is to keep them as protected from extreme temperatures and direct sunlight as possible. Items not to be shipped on a moving truck include pets, of course. Similar to plants, your animal friend would find the transportation conditions in a moving van highly appalling. Therefore, moving companies will not move pets (even on shorter relocation trips), and you should never endanger the life of your pet animal in such a reckless manner either. Move your pet in your car. This, of course, is the most sensible option because your pet will stay with you during the actual move, and that fact alone will keep them as calm and stress-free as possible. Take your pet to the see a certified vet before the car trip just to stay on the safe side of things. Then, decide if you’re going to use a suitable pet transportation container, especially if you own a cat. Fly with your pet to your destination. Contact the airline company way in advance to get familiar with their specific requirements for transporting pets on their planes. The more time you have to prepare your pet for air travel, the better. Special pet movers. If you still need somebody else to transport safely your dog, cat, bird, or other types of pets, then you may choose to trust a professional pet moving company that specializes in pet transportation. Good to know: Moving day mistakes? Err another day. The list of things movers won’t take also includes items of high sentimental value – that is, irreplaceable items that moving companies won’t be able to restore or even compensate should something bad happens to any of them. Don’t trust anyone but yourself when it comes to moving irreplaceable items to another home. 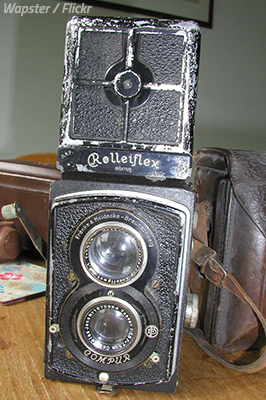 Think of an album of old photos – a priceless heirloom that has been handed down from generation to generation within a single family. How could a professional mover possibly compensate a customer for such a clearly irreplaceable item? Sometimes it can be really tough to know what things not to pack when moving home. Make sure you get the non-allowables list from your moving company so that you won’t waste any time preparing and packing household items that you shouldn’t. Whenever in doubt even with the list of non-transportable items, simply contact your moving company and ask them – they should know the answer.